Mayor Ed Lee has created the Navigation Center (NC) on Mission Street near 16th to offer homeless people various services including a warm place to sleep at night and a secure location to store their belongings, and bring pets. This pilot program is managed by Bevan Dufty, the homeless czar, and his HOPE office at City Hall, was funded by an anonymous $3 million donation, as the mayor's reelection campaign gears up for November, and I believe the NC is an election year Potemkin Village allowing him to point to the facility as evidence he's addressing homelessness. Thanks to a public records request, Mayor Lee has released several informative responsive documents shedding light on the NC's operations thus far. 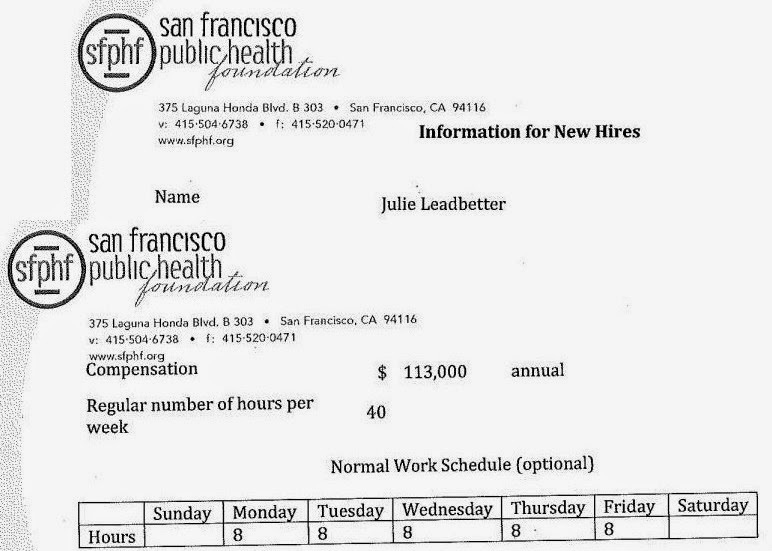 The newly-hired director of the NC is Julie Ledbetter, who previously worked for Mission Neighborhood Resource Center and the Mission Housing Development Corporation, and her annual pay is $113,000. 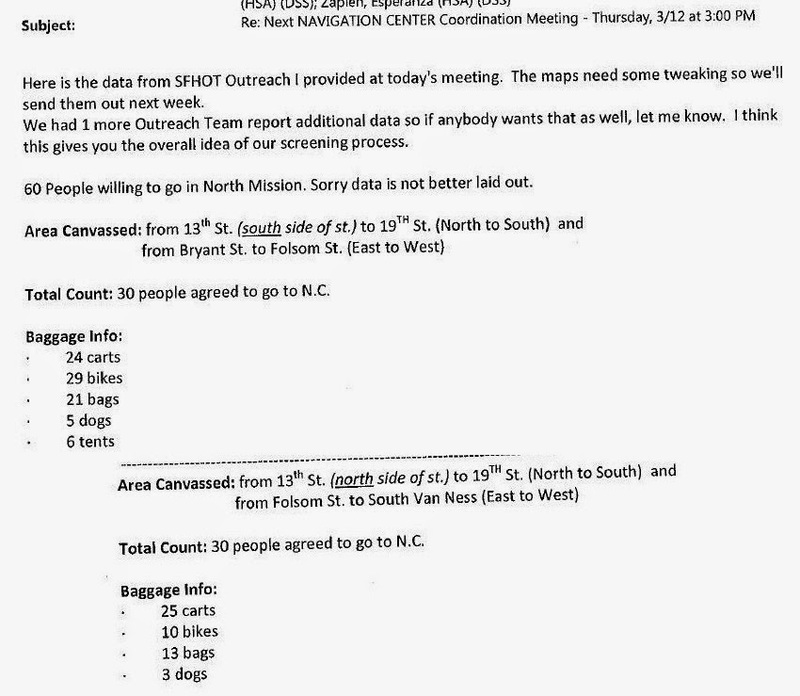 Dufty received an email about the March 12th NC coordinating meeting from a staffer at the Human Services Agency (HSA) regarding number of homeless people reached, 60 total, who expressed interest in the center. Figures were also given about baggage info. I wonder how much of those 60 folks have made their way to the NC. Via a tweet, Dufty informed me today that 16 clients accessed the NC in its first week and the number jumped to 31 a week later. 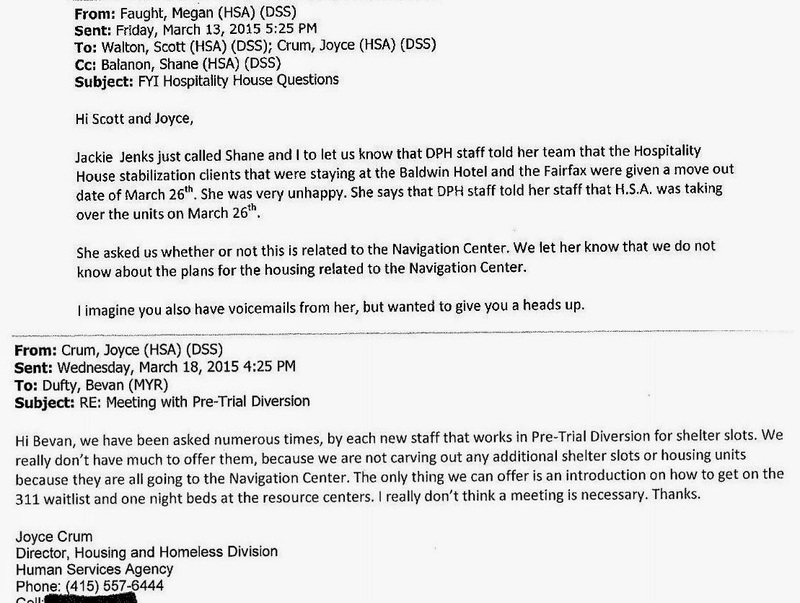 A March 12th email from HSA complained about the Hospitality House homeless shelter nonprofit displeased they had to evict their clients from two SRO hotels, in order to make units available to Dufty and Ledbetter at the NC. On March 18th, the director of housing and homeless programs at HSA, Joyce Crum, wrote to Dufty explaining the pre-trial diversion office of municipal court needs shelter beds to offer homeless defendants not taken into custody at hearings. Crum writes that HSA is "not carving out any additional shelter slots or housing slots because they are all going to the Navigation Center." So, a few formerly homeless people who were being housing in an SRO were "moved out" to make their units available to the NC and HSA admits no new shelter or housing units are being created. This plays into my scenario that Mayor Lee isn't actually creating lasting or genuine solutions to the homeless problem, and the Mission and 16th Street Navigation Center is little more than Potemkin Village gloss.